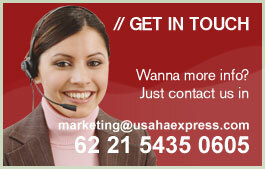 Here at USAHA EXPRESS (UE), we offer you a good service for your import and export needs. When we first start this business in 1960, we only start from minimal asset and over the years we grew up as one of the top five export/import company in whole Indonesia. Now as the market has grows rapidly we are facing more tough competitor with the big four such as DHL,TNT.FEDEX and UPS but we are still confident to survive in these line of business with our specialty which other big four company can not provide such as personalized service to our individual customer top five export/import company in whole Indonesia. Our strength is also back up by export of newspaper and magazine to Hong Kong and Singapore on daily basis which make UE brand is recognized by most Indonesian and native of both country stated above. We are now put more attention in our courier business as we are able to use international courier network to help our courier business going. With the help of international courier network, now we can sent almost anything to almost most the country in the world.